The process of colonization of East Timor by Portugal began in the middle of the 16th century. In 1702 East Timor officially became the colony of Portugal, known as Portuguese Timor. The western part of the island of Timor was colonized by the Netherlands and later became the territory of Indonesia. The decolonization process of Portuguese Timor was instigated by the 1974 Portuguese revolution. A civil war broke out in East Timor between the supporters of the Revolutionary Front for an Independent East Timor (Fretilin) and the Timorese Democratic Union (UDT). The development of East Timor was watched closely by Indonesia and Australia, the first even made attempts to incorporate its territory into the Indonesian state. 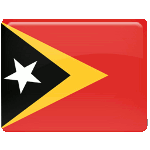 On November 28, 1975 the leader of Fretilin made a unilateral declaration of independence of the Democratic Republic of East Timor from Portugal. This attempt was recognized only by six states: Albania, Guinea, Cape Verde, Guinea-Bissau, Mozambique and São Tomé and Príncipe. The founder of Fretilin Francisco Xavier do Amaral became the first President of East Timor. Although East Timor was internationally recognized as independent state only on May 20, 2002, Proclamation of Independence Day is annually celebrated as a public holiday.